Which is better, the aroma of a smokey barbecue, or of fresh bread baking? Both! Fresh off the grill, these flat little buns are great for burgers, cheese sandwiches, or as a dipper for hummus. Dissolve sugar and yeast in lukewarm water, let stand 10 minutes. Meanwhile, heat milk to lukewarm and mix with warm water, oil, sugar and salt. Add yeast mixture to the rest of the liquid ingredients. Add the first three cups of flour, one cup at a time. Turn the dough onto a board and knead for 8 minutes, working in as much of the fourth cup of flour as you can. Pour a tablespoon of olive oil into the bottom of the bowl. Turn the dough bal around in the oil to coat the top and flip it dough-side up in the bowl. Cover with a cloth and let rise until double, about half an hour to forty-five minutes. If you are using whole wheat flour, knead the dough again after half an hour and let it rise for another half an hour. Punch the dough down and shape into a dozen balls. (I will split the dough in half, then half again, then twist each quarter into three portions.) To shape the balls, roll them in your hand, outer dough-in, as if you were flipping them inside-out. Pour a bit more oil in the bowl and lightly coat your hands. Quickly roll each dough ball in your hands to coat with the oil, re-dipping your hands as needed. The light coating of oil will keep the dough from drying out during the next rise. When the coals are hot (or the gas is on) close the lid to heat up the grill like an oven inside. Take the buns out on the cookie sheets. If your grill has a temperature gauge, note that 450F internal temperature is ideal. Keep the lid down until just before you put the buns on the grill. You have to move quickly to get a good rise without burning the buns. Grill is hot, the buns are ready, you have a flipper and a pair of tongs on hand.... GO! Open the lid, and gently place half a dozen buns on the grill. Try to avoid the middle and other "hot spots." Close the lid. After about five minutes, open the lid again and turn the buns over. 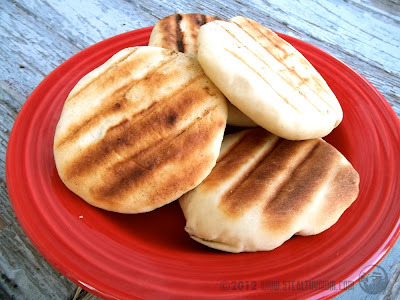 They should look like toasted english muffins. Close the lid again and wait a couple minutes. The buns should rise quickly due to the high internal heat. You can move them around some to ensure they are golden on both sides. After you take them off, close the lid on the grill to raise the internal temperature again. Grill the next half dozen. When you are done with the bread, put your burgers, veggies or whatever else you have to cook on the grill. The buns will soften up on the outside while the rest of the meal is cooking. The buns freeze very well in a sealed zip-lock. I shared this recipe with the Ultimate Recipe Swap- Grilling Edition.